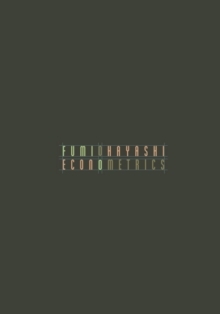 Hayashi's Econometrics promises to be the next great synthesis of modern econometrics. It introduces first year Ph.D. students to standard graduate econometrics material from a modern perspective. It covers all the standard material necessary for understanding the principal techniques of econometrics from ordinary least squares through cointegration. The book is also distinctive in developing both time-series and cross-section analysis fully, giving the reader a unified framework for understanding and integrating results. Econometrics has many useful features and covers all the important topics in econometrics in a succinct manner. All the estimation techniques that could possibly be taught in a first-year graduate course, except maximum likelihood, are treated as special cases of GMM (generalized methods of moments). Maximum likelihood estimators for a variety of models (such as probit and tobit) are collected in a separate chapter. This arrangement enables students to learn various estimation techniques in an efficient manner. Eight of the ten chapters include a serious empirical application drawn from labor economics, industrial organization, domestic and international finance, and macroeconomics. These empirical exercises at the end of each chapter provide students a hands-on experience applying the techniques covered in the chapter. The exposition is rigorous yet accessible to students who have a working knowledge of very basic linear algebra and probability theory. All the results are stated as propositions, so that students can see the points of the discussion and also the conditions under which those results hold. Most propositions are proved in the text. For those who intend to write a thesis on applied topics, the empirical applications of the book are a good way to learn how to conduct empirical research. For the theoretically inclined, the no-compromise treatment of the basic techniques is a good preparation for more advanced theory courses.